On February 10, 2016, Kumamoto University concluded an academic and student exchange agreement with Pathein University of the Republic of the Union of Myanmar. 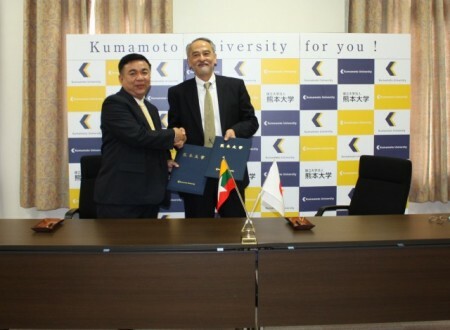 Pathein University and Kumamoto University’s Faculty of Engineering, Faculty of Science, and Graduate School of Science and Technology realized a faculty-level academic exchange agreement in 2015, and in order to expand the range of these exchanges, a new academic and student exchange agreement was concluded this time between the two universities. Pathein is the second largest harbor city in Myanmar following Yangon, and Pathein University is one of the main universities that foster highly qualified specialists for the further development of Myanmar. Together with Kumamoto University, both joint research and researcher exchanges have been conducted in the field of engineering, and students from Pathein University have enrolled for a short term in Kumamoto University’s graduate school. In these ways, diverse and meaningful academic and student exchanges are being conducted. The Rector, Dr. Nyunt Phay, and two others from Pathein University participated in the signing ceremony. Witnessed by staff members of both universities, the Rector Dr. Nyunt Phay and President Shinji Harada placed their signatures on the agreement and shook hands firmly. After the conclusion of this agreement, expanded exchanges throughout the universities as well as the development of exchanges in new fields are also expected. Following the signing ceremony, attendants visited the Graduate School of Science and Technology, the Graduate School of Pharmaceutical Sciences, and the School of Pharmacy’s Eco-Frontier Center of Medicinal Resources, which included tours of the facilities and discussions on mutual exchange of students and the possibilities of joint research. And on February 12, the “Japan-Myanmar International Symposium in Kumamoto 2016” was held at the Miyamoto Memorial Hall in Oe Campus on the theme of launching a new international partnership in research and education from the perspective of bringing together the fields of natural sciences, pharmacy, and engineering. On January 28, ten researchers from the Graduate School of Science and Technology at Kumamoto University visited Dai-Ni High School, a local high school in Kumamoto which has been designated as a “Super Science High School” by the Japanese government. 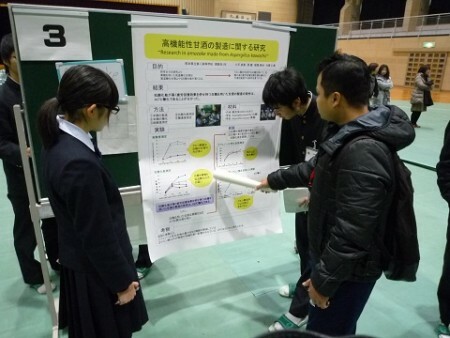 The researchers listened as students of Dai-Ni High School presented their research topics in English, and then asked questions about the scientific process and results of each topic. The high school students and researchers overcame challenging language barriers to enjoy scientific communication in English. Kumamoto University’s Global Youth Campus looks to continue providing opportunities for local exchange between the university’s international students and the young local community.